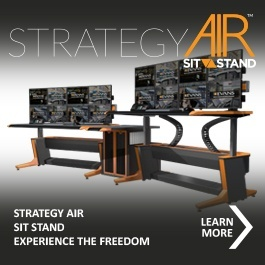 Designed for 24/7 lifetime use, Strategy Air Sit-Stand combines the latest in operator comfort and ergonomics with superior cable management and technology integration. Strategy Air Sit-Stand is a fully scalable control room solution that takes advantage of remote server technology. The innovative cable management system allows the console and the operator to be free from IT infrastructure and unsightly cables while offering long-term durability, functionality and a modern aesthetic. Strategy Air Sit Stand has been ergonomically designed to enhance the health and productivity of operators, giving flexibility to interact with their immediate environment. Designed to push the boundaries of tailored solutions, Strategy Air Sit-Stand can be configured in many ways to improve workflow and increase collaboration between workstations. As a stand-alone unit or part of a custom workgroup, Strategy Air Sit-Stand offers enough flexibility to fit perfectly into any command and control room environment. The central frame structure is designed with agility in mind. This open architecture allows complete flexibility for internal equipment configuration. The space between the upper and lower portions of the console is barrier-free, permitting equipment to float into either plane as required and thus supporting larger processors and auxiliary equipment. Strategy Air Sit-Stand incorporates the latest in slat support technology; you can choose from slatwall or slatrail systems. Both can handle a variety of mounted accessories, including large monitor arrays. The slatwall is available in a single, double or triple high configuration and the slatrail can even be curved to fit within a curved console configuration. Strategy Air Sit-Stand incorporates optional pop-up and slatwall power and data access including USB, DVI, Power, HDMI and Cat6 all prewired for easy connectivity. Strategy Air Sit-Stand utilizes wider and deeper cable raceways, allowing you to run more cables in an organized manner. Full front and rear access makes adding or changing cabling quick and simple. This sophisticated, integrated cable management system hides cables within the frame, while accommodating change as your technology needs evolve. Adding personalized controls like temperature and situational awareness provides you with the ultimate working conditions for your team. EnviroLinc and LumiLinc will provide your operators with the ultimate working conditions. Unlimited Design Options – Individual consoles, rows of operators or clusters of collaborative groups can all be easily accommodated with Strategy Air Sit Stand. Its modularity fits your needs today, and allows you to adapt to future changes. EVANS’ unique bridge system not only links curved console layouts, but provides equipment storage. Cable Management – It’s not what you see; it’s what you don’t see. The integrated cable management conceals cabling within the frame providing easy access throughout the console, while providing you the versatility to expand and contract with ease. Agility in Handling Your Technology – Strategy Air Sit Stand offers a PC holder in case you require local PC access. And for environments that have incorporated remote server technologies the PC holder can be easily removed and enjoy a truly open concept. Unmatched Ergonomics – Strategy Air Sit Stand allows the operator to move from a seated to standing position easily and quickly. Its added mobility contributes greatly to the comfort and well-being of the operator reducing downtime and creating a more effective and productive work environment.